We are a full service asphalt and seal coating company servicing South West Florida. FREE ESTIMATES Ask for a LENGTH of LIFE LEFT SURVEY (L3) Streets, Subdivisions, Neighborhoods, Communities, Commercial Parking Lots, Private Roads and more! Contact us today to inquire about our no hassle no obligation LENGTH of LIFE LEFT SURVEY for your homeowners associations, parking lots, mobile home parks, private communities, warehouses condo associations, RV Resorts and roads to receive a free comprehensive evaluation and report to help you budget for future assessments for your association and present day dollar cost. This service is available by appointment and will enable communities, churches, businesses etc. to budget for their future needs. Often times we can suggest some temporary repairs and give an estimate of the time extension those repairs will give you. With this service we can recommend preventative maintenance helping to save money over the long haul. Parking lots and neighborhoods are especially in need of our (L3) service. Property managers will find this service useful for their meetings with their residents to be able to budget properly and have a thorough understanding of repair vs. replacement as well as preventative maintenance. Identifying these problems prior to them occurring will assist property managers to recommend to the board a plan for assessments well in advance. Having us on the job site eliminates stress, hassle and headaches for many property managers as we take our jobs seriously and work as effectively and efficiently as possible. 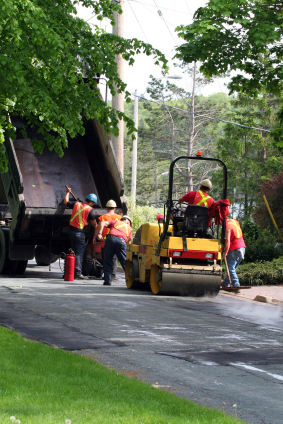 When choosing an asphalt supplier and paving contractor, property managers face huge challenges. Property managers need to know that we provide high-quality hot-mix asphalt and a professional team from inception to finish. We are available to answer all questions, concerns and educate as we complete your job in a timely fashion. Our asphalt is produced at one of our own plants with a long history of superior materials as well as quality control systems constantly in place, ensuring you the end user satisfaction. We have an onsite lab and test our materials regularly. The asphalt and pavement team from first contact to resurfacing your roads are polite, respectful, trained in safety and have a complete knowledge of hot mix bituminous paving mixtures, FDOT standards and specifications. We are leaders at building the roads that your neighbors drive on every day. Florida has a very unique base for roads and extreme temperatures as well as rainy seasons with this in mind you need an experienced company that is used to all the various elements and factors in providing you with the highest quality asphalt and paving maintenance services. We will work directly with your engineers, site work provider, home owners association, property manager, business owner and any other team member necessary assuring open communication throughout the entire process and beyond.